The key to making small tool tracking simple is to focus on building accountability. Small Tools are Valuable – Start Tracking them! A new solution for small tool tracking! Small tools have gotten a bad reputation. They are small in value. They are hard to keep track of. Unfortunately because of this, most contractors have quit trying to track their small tools. They have given up and simply expense them to jobs or bury them in general condition costs. While each individual tool is of small value, the total value of all small tools a contractor owns is significant. Small tools are a required input of construction but they don’t have to be disposable. If tracked properly, small tool loss can be minimized and significant savings can be found. 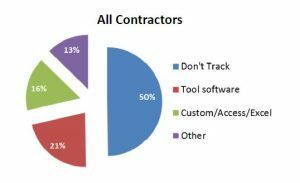 50% of contractors do not track tools that have a value under $1,000. They feel the cost and difficulty of tracking these tools is more costly than the loss of the tools. The CFMA survey also shows us that half of all contractors replace more than 20% of their tools each year. The annual cost to replace 20-50% of small tools each year is tremendous! This cost reduces profitability and makes competitive bidding much more difficult. The need to replace so many tools is obvious result of not tracking the tools. 1) The tracking has to be easy! It must not create a burden on the office. Mobile phones offer a unique opportunity to make tracking of tools easy in the field. For more information on our easy to use mobile app please visit the page: mobile tool tracking. 2) The tracking process should increase accountability! Simply assigning and forgetting about tools does not increase responsibility. The process for assigning and tracking the tools needs to re-enforce the importance of keeping track of small tools at an individual level. For more information on how to encourage responsibility please visit our page: construction tool tracking. By using new mobile technology, small tool tracking can be done more quickly and efficiently then ever before. Small tools have a high total value to a company and reducing the annual replacement costs of small tools can have a significant impact on company profitability. To learn more visit our tool tracking tips page for more articles or consider our tool inventory app for your company. Additional information is available about our tool tracker app. We also provide free tips on how other contractors are doing tool tracking and tool inventory in their businesses. Visit our “Tool Tracking Tips” page for information and white papers. Visit “Barcode Tool Tracking” for information about how to barcode tools and track tool inventory using barcodes. More sales videos and demonstrations are available. The tutorial page also provides training videos that are open to watch if you want detailed information.